Monday is here again !! 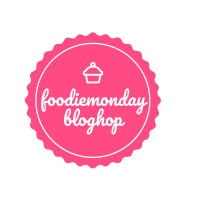 Monday means there must be a post for Foodie Monday Blog Hop team. This time the theme (171th) is decided as 'SaagSaga'. That means we have to make a post using any leafy green vegetable aka saag. Well when the theme was chosen, from that day I had listed a no. of dishes in my mind from my home state, Odisha for the contribution. And finally I have ended up with a no-onion-no-garlic curry using amaranth leaves as Amaranth Leaves Curry aka Koshala Saga Tarkari. Saag / saga plays a vital role in Odia cuisine. There are a number of plants which are used as sag like Palanga Saga (spinach leaves), Koshala Saga (amaranth leaves), Poi Saga (malabar spinach), Kalama Saga (water spinach leaves), Sajana Saga (drumstick leaves / moringa leaves), Madaranga saga (alternanthera sessilis), Pita Saga (glinus oppositifolius), Sunusunia Saga, Kakharu saga (leaves of pumpkin plant) and many more. The simplest way to indulge these leafy greens for me is : First wash and clean the leaves; chopped them; heat oil; add panch phoron, whole red chili, sightly crushed whole garlic cloves; add chopped leaves, salt; mix well and cover; thats all. I love any leafy greens in this way mostly along with water rice (pakhala) or steamed rice-dal combo. 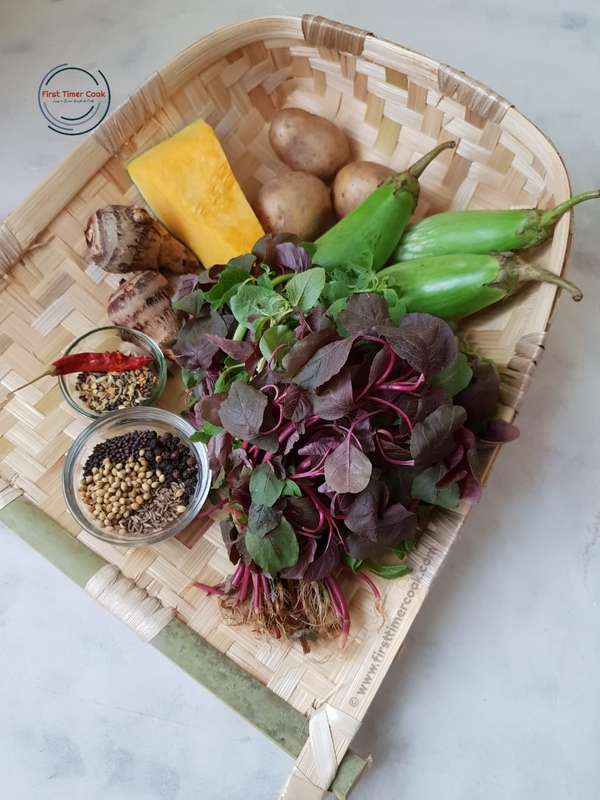 But today which I have shared the saag dish, Amaranth Leaves Curry aka Koshala Saga Tarkari is prepared using amaranth leaves, some vegetables and a specific masala paste. The saag here used is the amaranth leaves / koshala saga but, I have added both green as well as red varieties. The paste is prepared of cumin seed, mustard seed, whole black pepper, coriander seeds along with little amount of water. The dish is basically prepared in temples, so it is without onion-garlic vegetarian dish. So for any festive season this tarkari is perfectly fit to be on the menu. If you want to try in any other day, then some garlic cloves can be added while making the paste. And also the whole black pepper can be omitted. Instead of ghee, mustard oil can be used to enhance the flavor of the dish along with the garlic flavor. The authentic preparation uses ghee, but I have opted oil here to include a healthy note. First make a fine paste of cumin seeds, mustard seeds, whole black peppers, coriander seeds and a little amount of water. Keep aside. In a pan, then heat 1 tbsp ghee and shallow fry the badis till golden brown in color. Transfer those fried badis to a plate and keep aside. Next to the same pan, add 1 tbsp ghee again. Add all the chopped vegetables except eggplant and saute for 2-3 minutes. Next add chopped eggplant, turmeric powder and salt. Mix everything well and add some water (around 1/2 cup). Cover the pan and allow to cook till the vegetables are soft a bit, not overcooked. Then add the paste which is prepared in the first step and mix well. Next add chopped amaranth leaves / koshala saga and the fried. Mix well and again allow to cook till everything is done by covering the pan. Next in a tadka pan, heat 1 tbsp ghee. Add whole red chili, asafoetida, panch phoron and allow to crackle. Pour this tempering onto the pan. Mix gently and allow to cook for 1 minute more. Turn off heat and add grated coconut. Give a gentle mix again and serve as a side dish with steamed rice-dal combo ! Oil I have used here. But ghee can be used to get the authentic temple flavor in the dish. Always keep in mind that after washing the amaranth leaves / koshala saga, these leaves should be drained out completely placing in a colander. OMG! Sounds yum! 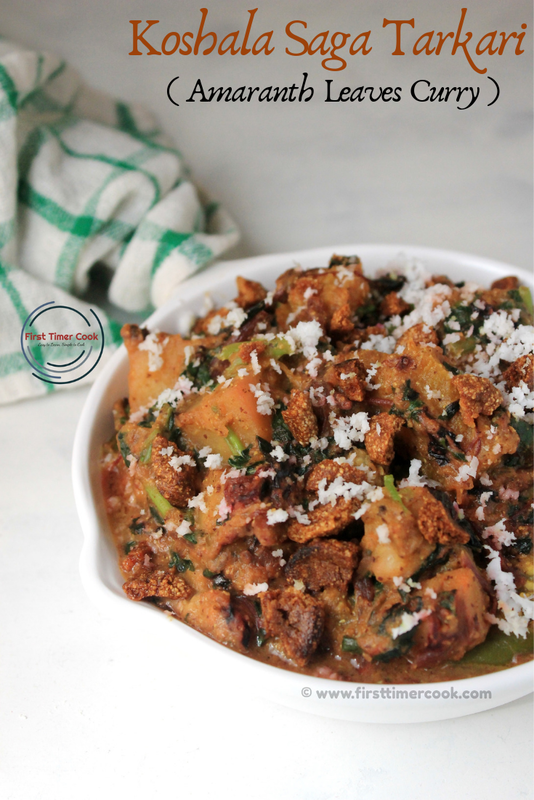 I am sure will love to try this recipe sounds so yum especially the no onion and garlic part. What a different kind of saag, Sasmita. Love the different vegetables you've added and the fact that it can be made without onion or garlic. I love learning about new Odia dishes from you. 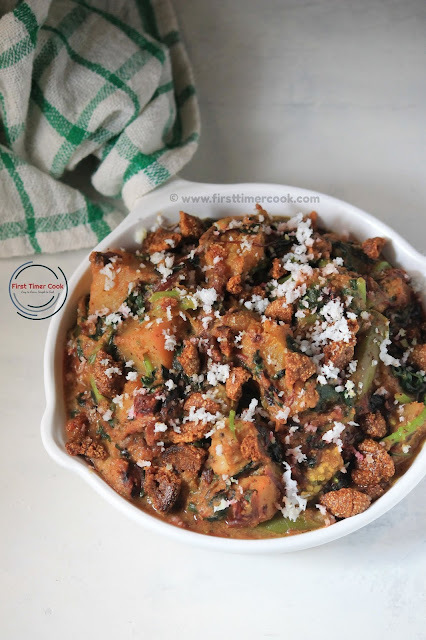 Such a delicious blend of vegetables and greens Sasmita! Loved the sabzi and the recipe. Addition of badi sounds fun too. PaanchPhoran, Masala paste, everything sounds so yum! I love the look and sound of this sabzi. Glad to get acquainted with this traditional Odia preparation. Such a delightful blend of veggies!!! Thanks for sharing the authentic dish from Odisha !! Looks so yummy and it’s healthy too!! Ah Sasmita I am drooling. 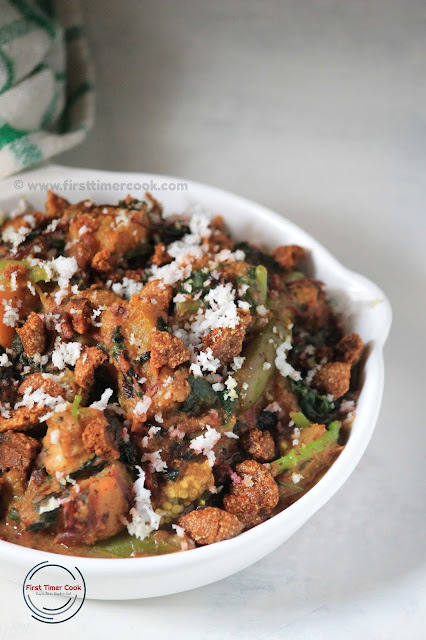 This is similar to our sager ghonto with bori and vegetables. But we add little sugar in ghonto. Really loved your recipe. Next time I will make your version. Love this odiya style amaranth leaves curry. Addition of different veggies makes it more interesting. Awesome share Sasmita. What a jabardast dish this is,Sasmita, with a variety of vegetables, saag and even badi. Perfect for when one feels like cooking something interesting but not too difficult, or when visitors come home and one wants to offer an unusual dish. The masala paste sounds awesome, it must give a real zing to the curry. Do you use yellow mustard seeds or black ones, for this paste? I have used the black mustard seeds here for the paste. yes seema, you can skip badis. That just adds a crunch in the dish :) And yes, I have not used colocasia leaves here dear.